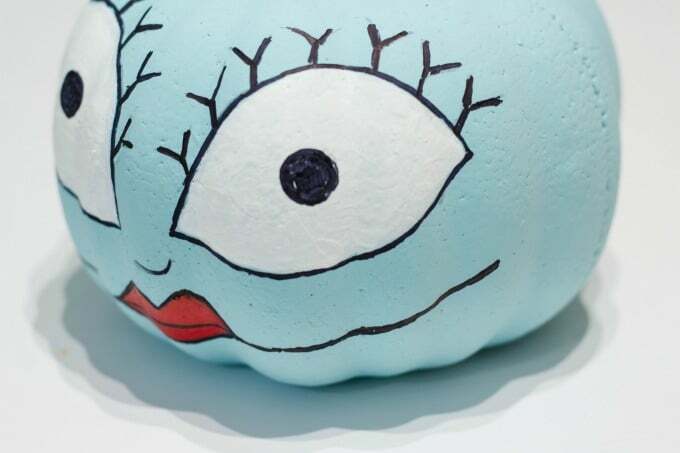 Do you get excited when pumpkin decorating season rolls around? 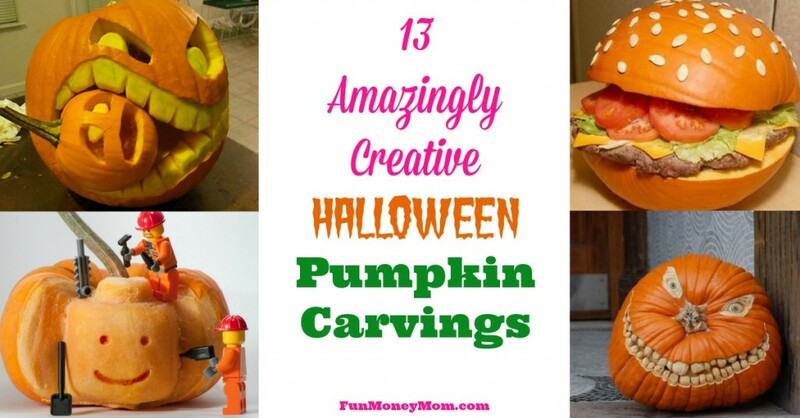 Why not make pumpkins with a theme for Halloween! 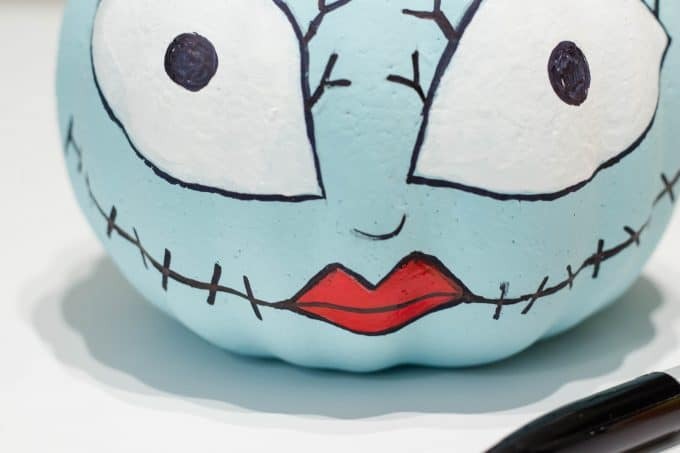 This Sally Skellington pumpkin is perfect for fans of the Tim Burton classic, The Nightmare Before Christmas! What’s your favorite thing about fall? 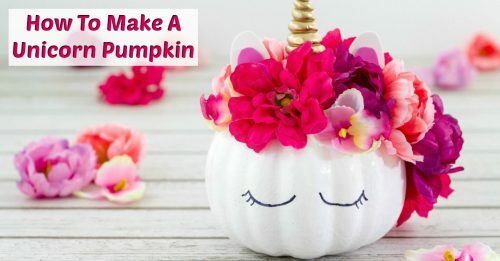 Mind is definitely decorating pumpkins and I might just go a little pumpkin crazy when fall rolls around! 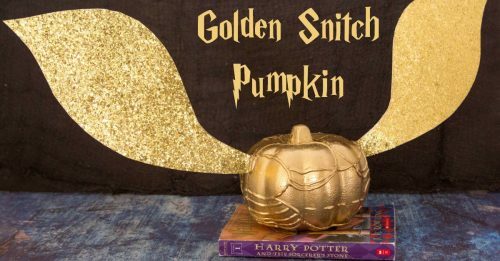 This year alone I’ve made a unicorn pumpkin, a Hello Kitty pumpkin and even a Golden Snitch pumpkin. I wasn’t done though. I’d been planning to make a Jack Skellington pumpkin last year but just ran out of time. When I finally made one last week, I thought he looked a little lonely. 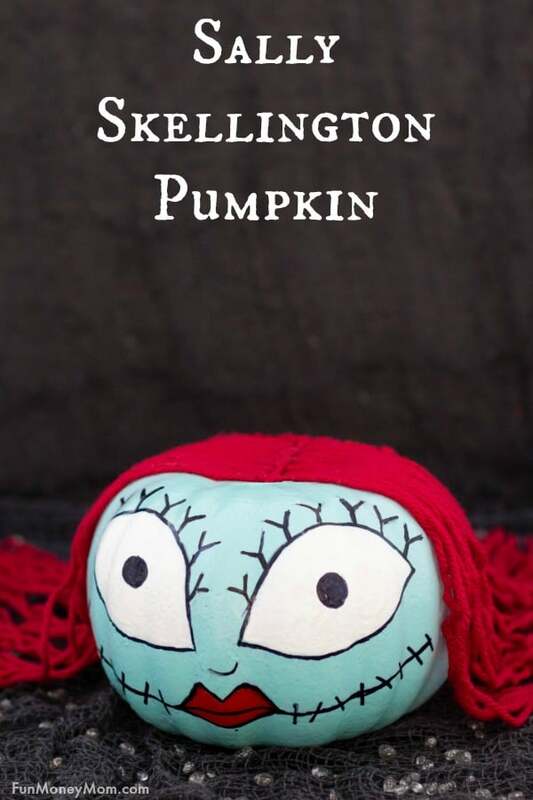 He needed a Sally Skellington pumpkin to keep him company! Start by snapping the green stem off the pumpkin. 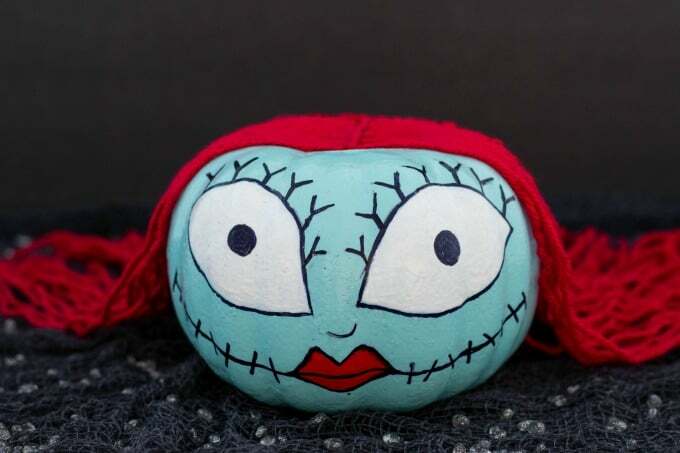 You’ll want the top flat so you can add Sally’s hair later. 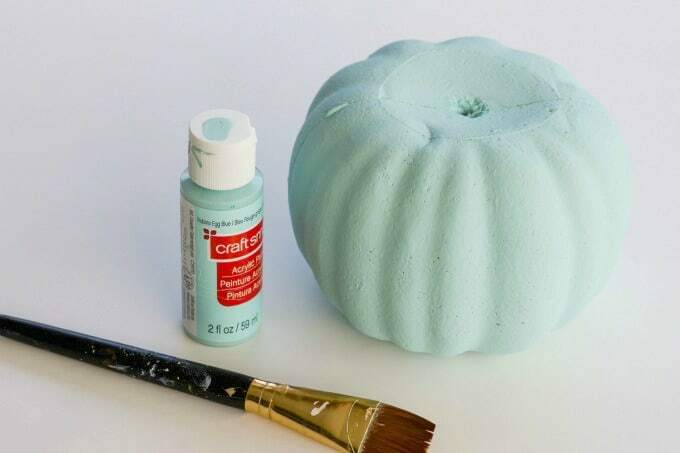 Paint the pumpkin with light blue acrylic paint. You’ll need a 2-3 coats. I started by using a pencil to draw the face. I find it tricky to make the eyes symmetrical so this way if I don’t like the way they look, I can paint over them and start over. Another trick is to cut out a piece of paper in the shape of the eyes and trace around it. 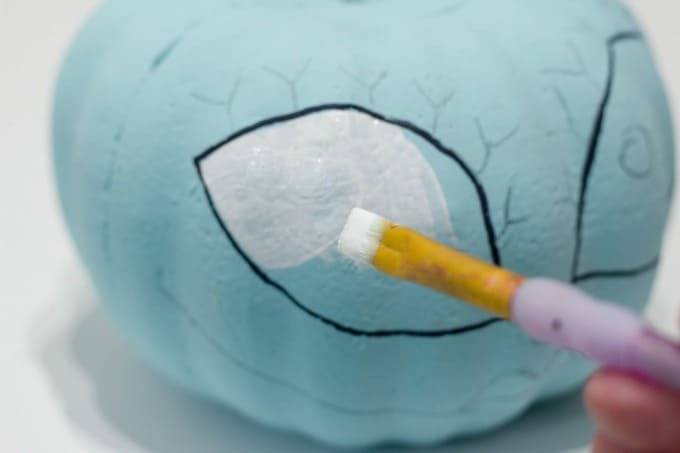 Once you’re happy with the way your Sally Skellington pumpkin looks, paint the eyes with white acrylic paint. Once the eyes are done, paint the lips red. Now draw in the details. Start with the eyelashes. 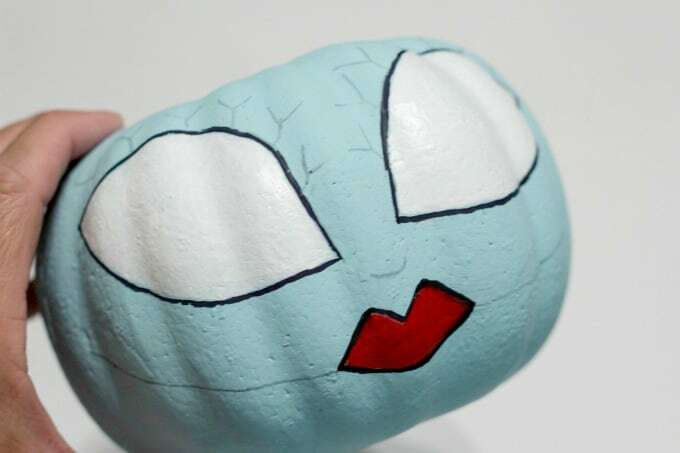 Then draw the stitches on the mouth. Finally, add the hair. I cut strands approximately 12 inches long and glued them from the middle so she’d have a part. I went almost all the way to the back, then added the hair on the other side. 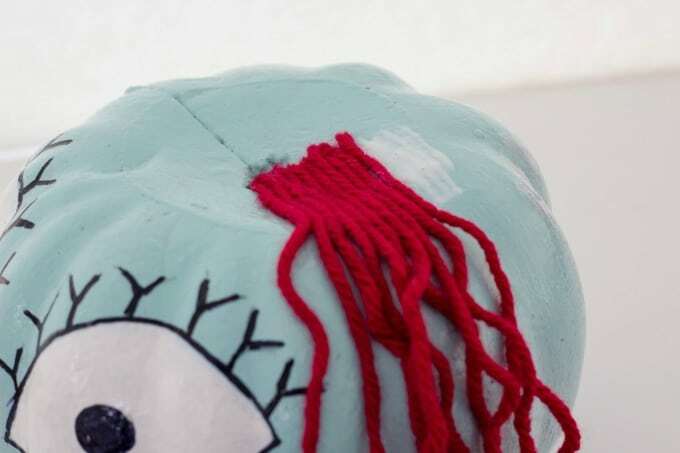 Next I added one piece of yarn down the middle for the part, then glued hair to the back of the head. Once the hair has dried, you have your Sally Skellington pumpkin! My 10 year old daughter thought it was awesome and a thumbs up from her is worth it’s weight in gold! 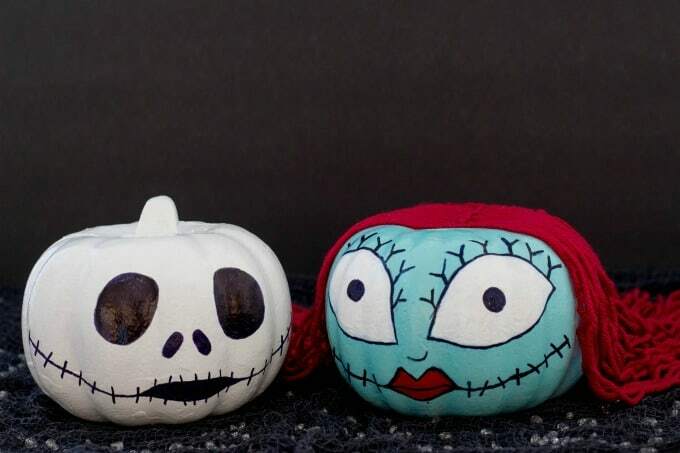 Sally and Jack look pretty cute together, don’t you think? 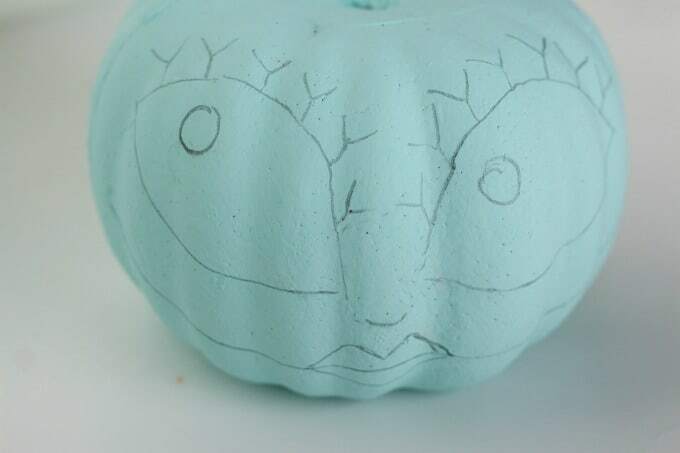 If you’re in the mood to get crafty, check out these fun pumpkin decorating ideas!